The Jabrin castle, also known as Jabreen castle or حصن جبرين in Arabic, is located near Bahla in central Oman, 180km southwest of Muscat. 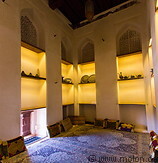 It was built in 1675 by Imam Bil-arab bin Sultan and was an important science and Islamic law centre. From the exterior the castle looks like a fortress, but the interiors are complex and richly decorated and in fact the castle was the residence of the local sultan. The castle was completely restaurated in 1984.